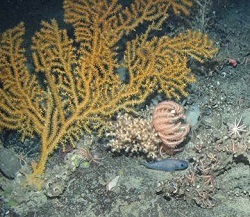 The research of Dr Kerry Howell and her team is focused on deep-sea ecology, deep-sea conservation and management, spatial planning, high seas / deep-sea marine protected areas, habitat classification, habitat mapping, predictive species modelling, deep-sea food webs, and the ecosystem impacts of deep-water fisheries. Below are details of our current research projects. Deep Links is a NERC-funded collaborative project between Plymouth University’s Deep Sea CRU and the University of Oxford, in partnership with the Joint Nature Conservation Committee (JNCC) and the British Geological Survey (BGS). During this project, we will investigate how patterns of population connectivity vary with depth in the deep-sea, and how this influences species diversity. In the marine environment, many species do not move as adults (e.g. corals) or move very slowly (sea urchins). This means that for different adult populations to remain connected they rely on the dispersal of early life history stages. Most marine species have a larval stage that lives in the water column for a period of time, moving with the currents, before settling in a new area. It is larval dispersal that keeps distant populations connected. In the deep-sea (>200m), the bathyal region of the continental slope has been identified as supporting high numbers of species and being an area where the rate of origination of new species may also be high. The reasons for this are not clear, but given the importance of connectivity to population isolation and speciation, it follows that the key to understanding patterns of species diversity in this region lies in understanding connectivity. AUVs and robotic vehicles provide a new method for undertaking rapid assessment of seabed habitats, species and geology. Their ability to gather vast datasets of seafloor imagery could revolutionise deep-sea science. However, these large image datasets currently require interpretation by trained human observers. This process is extremely time-consuming and costly. In addition, humans are prone to error, especially during repetitive tasks, and that error is inconsistent both within and between observers. Automated interpretation using artificial intelligence (AI), offers a significant advance in the consistency, speed and quantity of data that can be interpreted. This proof-of-concept project is aimed at understanding the capabilities of existing AI algorithms in discriminating between taxa in seafloor image data. We will quantify accuracy and reliability of open source AI in the interpretation of images. This project is using seafloor image data acquired by the AutoSub 6000 AUV as part of the Deep Links project, the Biigle2 image annotation software, and Google’s Inception Classifier and the TensorFlow framework. Use of predictive habitat modelling to assess the distribution and extent of selected Vulnerable Marine Ecosystems in the South Atlantic deep sea. The South Atlantic is one of the most poorly studied areas of the World’s Oceans, particularly the deep water areas. Yet the South Atlantic is the subject of increasing exploration and exploitation in the form of fishing, deep-sea mining and oil and gas exploration. The UK oversea territories of Ascension, St Helena, Tristan da Cunha and the Falkland Islands, are in the process of developing marine spatial planning strategies for their respective waters. For these small island nations the marine environment holds invaluable cultural and spiritual significance as well as generating jobs and revenue via the fishing, tourism and recreation sectors. One of the challenges to developing marine spatial plans within these nations EEZ is the lack of available data, particularly for deeper water regions. This problem is exacerbated when moving outside EEZ to the High Seas (including The Area). Habitat suitability modelling (HSM) is a promising tool in the development of sustainable management of the deep-sea. In the North Atlantic predictively modelled maps have proved useful in providing a scientifically robust and repeatable means of estimating extent and distribution of species and assemblages (Davies et al., 2011; Yesson et al., 2012; Ross & Howell, 2013; Ross et al., 2015; Howell et al., 2016,). To our knowledge no such modelling has been attempted in the South Atlantic. For HSM to be a useful tool it is important that we understand the drivers of accuracy in models, and therefore what factors are important to consider when using predictively modelled maps to inform marine spatial planning. This project aims to address this research need working in collaboration with Cefas, as part of the UK Government Blue Belt Programme, British Antarctic Survey and Institute of Marine Research, Norway. Deep-sea science and technological developments go hand in hand. Great advances in deep-sea science have often followed technological innovation. Our group works with industry partners to develop new tools for deep-sea science. One of our most recent success is the development of Deep Search 2 (DS2), a low cost £3000m rated towed HD camera system that is highly adaptable and portable. On-going projects include development of a low cost structure-from-motion (photogrammetry) rig for AUVs (deep water tests) (shallow water tests), novel camera systems, and larval capture devices. Natural product screening programmes have provided an impressive catalogue of bioactive healthcare molecules, most notably ~70% of antibiotics used in treatment of infectious diseases and numerous cancers. Sponges are, perhaps, the most prolific source of natural products with more than 7,000 bioactive compounds identified. Existing research has focused on shallow water species, but much of the world’s biodiversity is located in deep-sea regions and the potential resource that exists within this ecosystem is largely un-explored. This project, led by our colleague Dr Mat Upton, is investigating diversity, function, and potential bioactive properties of the microbial communities of deep-sea sponges. The project is funded by Plymouth University and the Society for Applied Microbiology. Hear more about this work in our short YouTube clip. DeepSeaCRU are leading the way in the field of deep-sea habitat mapping through the Mapping the Deep Project. This project will provide marine environmental managers with accurate maps on which to make decisions about where we allow human activities such as fishing and mining to go on, and placement of Marine Protected Areas. These maps will also allow us to learn more about what habitats are in our deep-sea, which ones are rare, and which are most vulnerable to human activities. The mapping the deep project uses state of the art equipment such as multibeam and Remotely Operated Vehicles, combined with modelling techniques to look at the different habitats in the deep-sea and the environmental conditions they are found under. For example, if we can show that cold water coral reefs are most likely to grow at certain depths, on rocky, sloped terrain, we can use this knowledge to predict where else might expect to find them. This is the basis of predictive habitat mapping. The Mapping the Deep project has already produced several modelled maps of the distribution of highly vulnerable deep-sea habitats which can now be used to help target future survey and conservation work. Our current focus is on independent validation of these models, and the further development of deep-sea habitat classification systems to support mapping efforts. We are working on models in both the North and South Atlantic under this umbrella project, including in the UK overseas territories (see above). Further details about the Mapping the Deep project are available in our project film. The European Habitat Classification system (EUNIS) currently lists 7 deep-sea biotopes. This makes it of limited use to those engaged in deep-sea biotope mapping since there are clearly more than 7 different types of recognisable deep-sea benthic assemblages. DeepSeaCRU have been working with UK Government to define new deep-sea biotopes for incorporation into the EUNIS classification system. Dr Howell and her team have also been working with international partners involved in the MESH Atlantic programme and the CoralFish programme, to define new European level deep-sea biotopes. An international workshop hosted by Dr Howell at Plymouth University resulted in the draft descriptions of over 100 new deep-sea biotopes. This new draft biotope catalogue will hopefully provide a ‘common language’ of units for European deep-sea biotope mapping, and the basis of a future development of the deep-sea section of the EUNIS habitat classification scheme. DeepSeaCRU have previously worked on broadscale mapping of the deep-sea for conservation planning.